I spoke with Hub on the Hill DirectorJori Wekin to learn more about the jobs directly and indirectly created and supported through the shared food processing “makerspace” and marketplace. The conversation ended up being about more than just jobs. The story of the Hub on the Hill is also about needs, risks, community support, partnership, and a unique and evolving vision for success. “The Hub on the Hill is inspired by the region’s local makers, farmers and food artisans of the North Country,” Hub founders describe. “It is not only a hub for local food and culture, but also a community space fostering creativity and shared services. Through collaboration, it strives to cultivate the dynamic local economy.” The Hub, located in Essex, NY, got its start in a commercial kitchen that was started at the Whallonsburg Grange Hall several years ago. With the support of a USDA Local Food Promotion Grant, the Hub on the Hill opened its doors last winter and held an official grand opening in June. Besides its well-equipped kitchen and food processing facility, the re-purposed warehouse offers a retail store, shared use machine shop, shared office space, and meeting space. 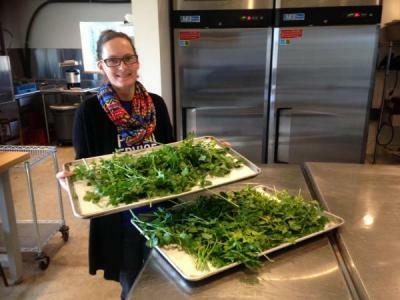 The Hub also hosts community food events that feature local chefs and food providers. As for jobs, the Hub is helping create and keep a number of them in the community. The facility directly supports three full-time and three part-time positions, including its director, production manager, and facilities coordinator as well as kitchen staff and folks who work in marketing and producer relations. Additionally, the Hub can be credited in helping to retain and support jobs in the region through its partnerships with farmers and other food producers. A recent report drafted by the Hub states that the business partners with 29 farms and businesses to process their raw products into prepared foods or value-added products. Jori explained that different partners use the Hub in different ways: to pack for their own farms or businesses, to employ Hub staff to process and pack for them, or to purchase local produce to create value-added products. As the Hub’s staff and capacity expands, Jori and her partners are exploring what expansion could look like at the facility. At a recent meeting attended by over 40 people, participants shared ideas for developing the Hub’s marketing and distribution capabilities. The business can help producers reach more local and regional markets by coordinating group orders and product distribution. Jori expects such an expansion would create around three to five part-time positions at the Hub, including staff for marketing, sales, and delivery. “By expanding its potential markets,” Jori said, “we can help small farms reach more markets, more people. We can also increase awareness of the food scene in the region.” In the process of marketing and promoting the region’s producers, Jori hopes the group’s activities will encourage new enterprises to get involved and take advantage of the shared resources available at the Hub. Despite the seasonal nature of food production on many local farms, the Hub is able to provide a reasonably stable jobs environment by supporting staff year-round. The Hub is currently going through its winter shift, working with winter storage crops and produce they have stocked in their freezers to process into value added products. ANCA is proud to assist entrepreneurs like Jori throughout the region. We are excited to support the Hub on the Hill as it continues to grow its business and expand its vision. We are eager to see how this business and its partners continue to engage and excite their communities. We will continue to be a resource for North Country communities as they seek out ways to build sustainable local economies. Stay tuned for more news from Jori and the Hub on the Hill!